There are a lot of different resistor types, all with their own applications, characteristics and construction. 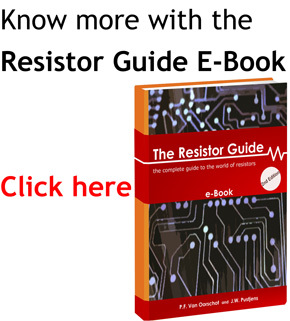 This page lists the different resistor types which are described on the resistor guide. The fixed resistor type is the most common resistor, when people talk about a resistor they most probably mean a fixed resistor. The picture to the right shows an axial carbon film resistor, the most common type. Fixed resistors have a constant resistance value. Different resistor materials are used for fixed resistors. For all resistor types the used materials has influence on the resistor properties like the tolerance, cost and noise. Fixed resistors are available in axial and SMD packages. There are several variable resistor types, their general property is that the resistance value is adjustable. Most variable resistors are adjusted by mechanical movement (linear or rotary). When they are used as a variable voltage divider, they are called potentiometers. When they are used as a variable resistance to control the current in a circuit, they are called rheostats. Digital potentiometers are controlled electronically instead of by mechanical action. In general variable resistors have a higher tolerance of 20% compared to fixed resistors where 5% is the most common. Thermistors are resistors of which the resistance changes significantly when temperature changes. Different thermistor types exist, the two most common types are the NTC and PTC thermistor. NTC thermistors decrease in resistance when the temperature rises, while PTC thermistors increase in resistance when the temperature rises. 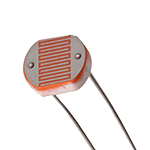 Thermistors are often used as temperature sensors or thermal protection devices. Varistors have a non-linear resistance which is dependent on the voltage over the varistor. Above a certain threshold voltage the resistance of a varistor drops very fast. Different varistor types exist, but nowadays the MOV varistor is the most used type. Their characteristics make them suitable as over-voltage protection devices and they are often used as surge protectors. Light dependent resistors or photoresistors show a decrease in resistance when light intensity increases. They are often used to identify light or dark situations and are for example used to switch on street lights in the evening. The magneto-resistor type can be used to detect and measure magnetic fields. The resistance of a magneto-resistor changes with the magnetic field strength and direction.